"Broadway on Brevard" Entertaining, Enriching, Inspiring, and High Quality Live Music and Theatrical Productions Since 1924. 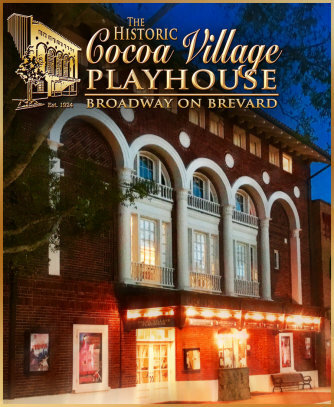 The Historic Cocoa Village Playhouse has been enriching the lives of residents and visitors of the Space Coast through quality music and theatrical productions for decades. Built as the Aladdin Theatre in 1924, it is currently listed on National Register of Historic Places as The Historic Cocoa Village Playhouse. Over the years, support from the community, the City of Cocoa, and very hard working individuals have elevated the Playhouse to become the high-quality live performance theater it is today. Locally known as "Broadway on Brevard", every season is packed full of professionally produced productions that are often sold out before opening night. 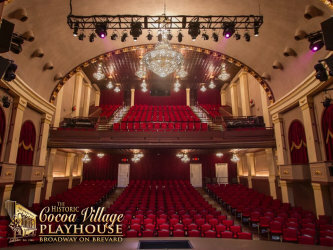 The Historic Cocoa Village Playhouse offers the highest quality live entertainment in Brevard. We offer a variety of productions throughout the year. Check out our website or follow us on Facebook to stay up-to-date on the season's schedule. Stars are born at the Playhouse! Are you a budding star? We hold open auditions throughout the year. No experience is needed! We train you while you have the time of your life. All ages and talent levels are welcome. Check out Audition information on our website to learn more. The Historic Cocoa Village Playhouse has helped weave the fabric of the Cocoa community through our STARS of Tomorrow Youth Program. Young performers learn important life management skills as well as how to succeed in the field of performing arts. Children ages 7 years through high school graduates are welcome to audition. Visit our website to learn more about STARS of Tomorrow. Students will have a summer to remember while participating in our Summer Musical Theatre Project. Beginners and advanced students will gain knowledge and experience, advance their skills, and have an amazing time for this 4 week summer program. Check out more information about the Summer Musical Theatre Project on our website.